Most often, you may have to take ideas about making your CV, for which you look for samples. In such a case you may find the samples of great CVs that you get free from template banks, to be really helpful. When you look for a reference, something perfect, official, and standard meets the requirements perfectly. 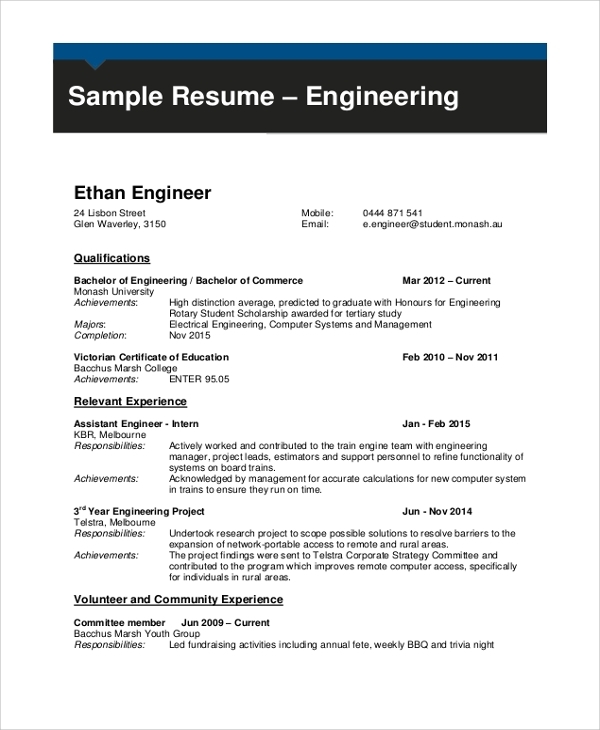 Here, are the examples of standard samples for engineering CVs. There is a difference between a sample and a Blank CV templates. You get a great guide from the sample to use as a blank template. 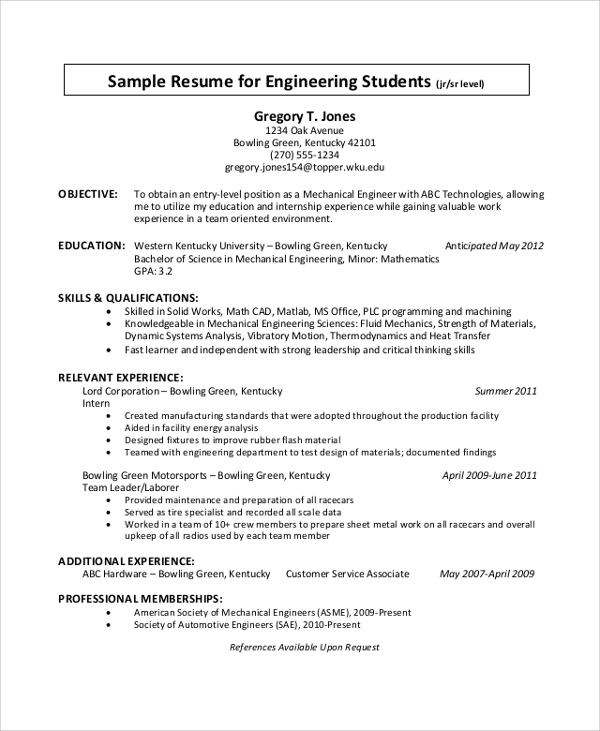 The civil engineering resume format is what you use when you are keen to make a CV for the civil engineer. Fresher or experienced does not matter, what matters is the position and type of work. It is dedicated for the civil engineers, and you would get great help in understanding the pattern required through this. 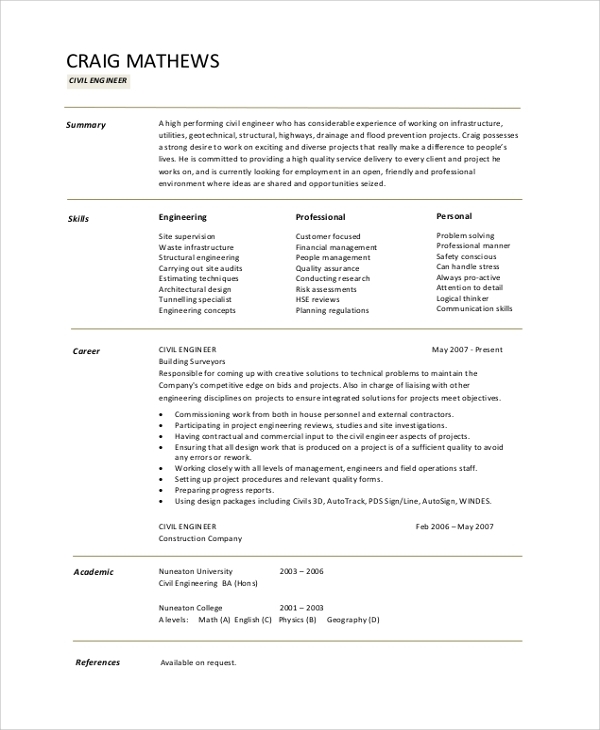 The electrical engineering CV sample gives a precise idea of what exactly the CV would look like for the electrical engineers. 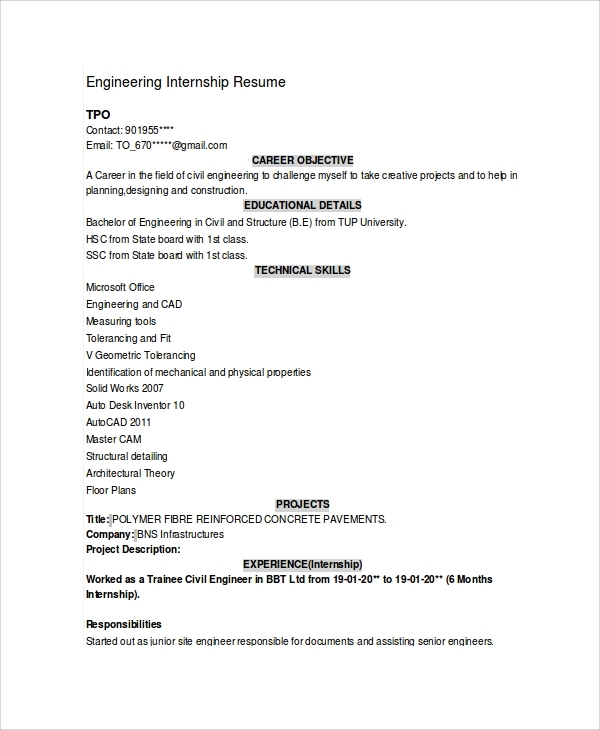 Stating about the experiences and relevant skills, projects completed, etc is important when you are making a engineer CV, which is shown on the sample in details. 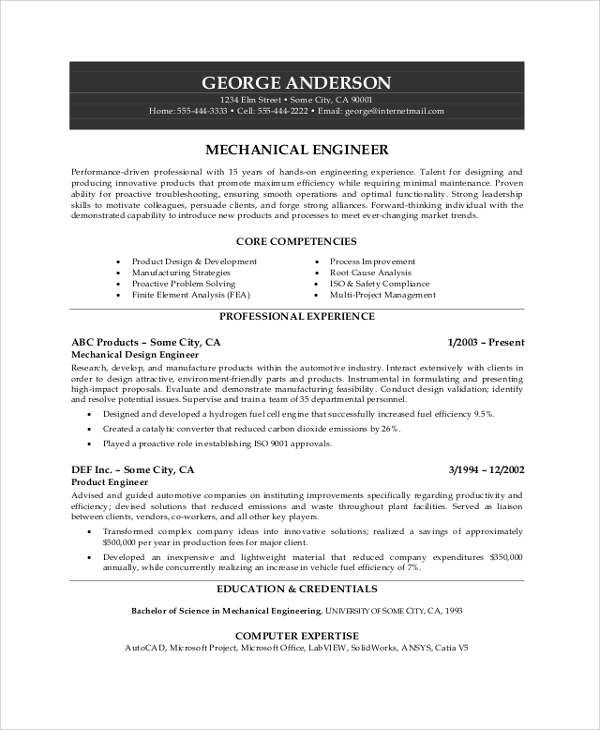 The mechanical engineer’s CV is what you would use to tell about your degrees, skills, experiences, project and accomplishments as a mechanical engineer. This CV style will give you the typical approach of CV making for this purpose, and would help you bag the job sooner with the right type of CV. Why use the Engineering CV Sample? When you are applying as an engineer in some place, you will have to tell many important facts about you through your CV, which will prove to the recruiter that you are the best or most desirable candidate for that job position. Now, to make it understood the CV should be designed such that it speaks aloud on your behalf. The presentation and style, the text position, images if any, the place of writing the segment or groups of data, the placement and position of the right data on the right place serially; all matter a lot. When you place everything correctly then that makes the much needed officially perfect CV. 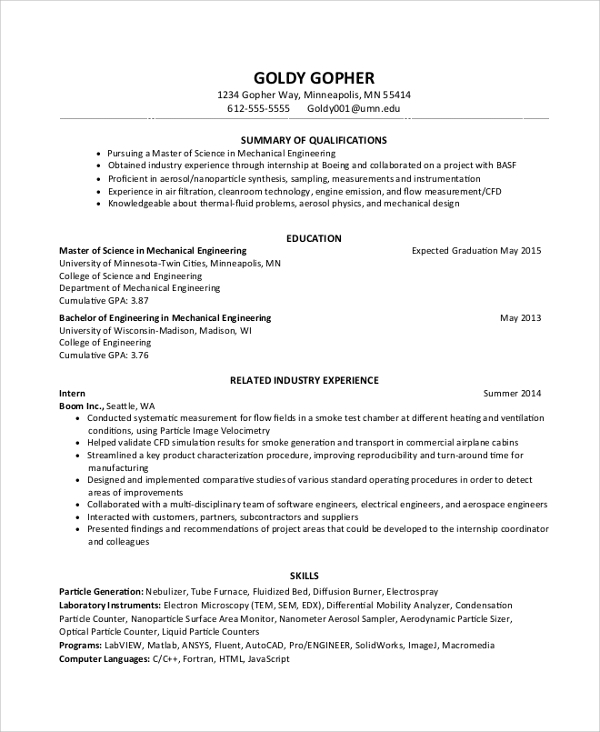 What is the Importance of an Engineering CV Sample? 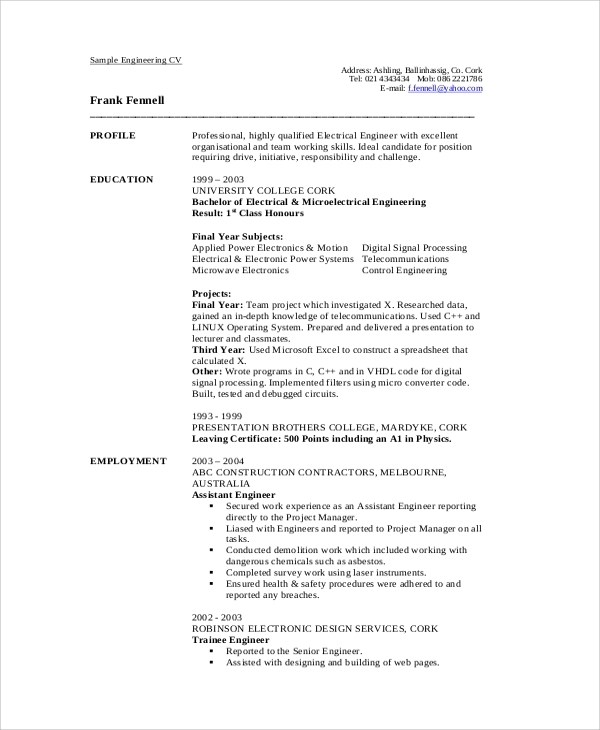 The importance of a perfect Engineering CV sample is huge. When your sample is correct, you get the perfect base to make a fresh CV. The perfect standards of the sample will help you understand, what exactly is required from your CV. The better the CV, the maximized will be your chances of getting selected. That is why, you must keep this in mind that you should try to make the best use of engineering CV samples that you get for reference here. How to Make Best use of the Sample Resumes? Usage of the samples can be done in two ways. You actually get both blank and Sample CV templates. Now, you may adopt two ways to use them first, download both the samples and the template is free. You get them in a friendly file format i.e., Word or PDF. When you like a sample, use this as your model to make the fresh CV, then you may use a downloaded template to make it, and write afresh on the blank template, or else you may directly edit or overwrite on the sample, change things, and use your details to make this your own CV. While you are trying to make the best CV for your engineering profile, you will always get great help from online resources, and template banks. 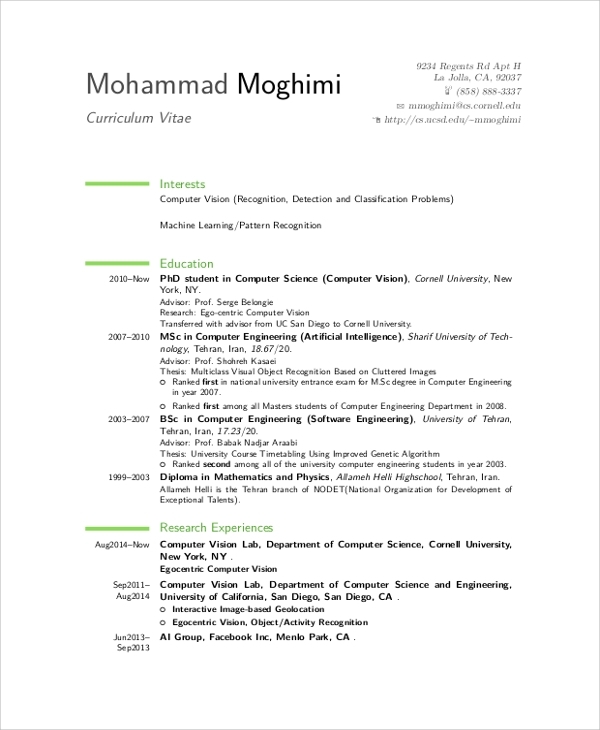 Make an engineering CV, or use an Academic CV template or create a fusion of the CVs for a more specialized role.